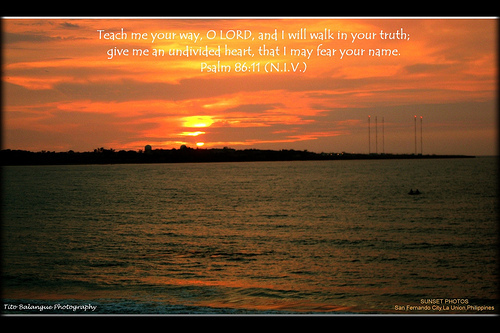 (Friday, March 15th 2013) Teach me your way, O Lord and I will walk in your truth, give me an undivided heart that I may fear your name. ~ Psalm 86:11. Can we trust ourselves to map out our own path or even carve out the trail we need to take on a daily basis? Is it possible that the steps we take on our own would allow us to enter into heaven one day? Can we trust our own intuitive feels each day and be guaranteed that we would have a successful outcome by the choices we have made on our own? I am positive that it is the testimony of many of us that we have tried to do things on our own, only to find out later on, that in order to know how to choose the path that would lead us into the way of peace and everlasting life is to learn how to follow the way of the Lord. We may not know all there is to know in life. We may not know every scripture in the bible no matter how long we live upon this earth, but one thing is certain, whenever we rely upon God, to teach us and to direct each step we take, we will be led the way of abundant life in Christ. Whether you knew this before or not, God has appointed the way for each one of us and when we are in doubt concerning it, we ought to seek Him to make it plain what we ought to do. God is truth. It is the way of truth that He teaches. Let us walk in it. It is my sincere hope that you have been blessed by this short Devotional today. If you are visiting Empowerment Moments for the first time, welcome. I encourage you to sign up to receive posts via Email subscriptions. Thank you and God bless you!